I had a few days off in a row for a change and have been enjoying decorating for the holidays. It is really fun to pull out the boxes and go through them, kind of like going through boxes of memories. All of them good! I used to try to display everything in the box, but apartment living has kind of put a damper on that so I have to pick and choose. It lets things be a little different each year. Wendy at Ivory Spring decorated her blue transfer ware display and I was so impressed with how well the green, red and blue went together. My transfer ware is all in my cupboard, but she has me thinking of bringing it out. I haven't done it yet, the wheels are still tu rning on that one. I did do something rather fun based on an idea that Heather gave me at work. She had the guys bring in a huge concrete pot to stick one of the big fake trees in as its base and it looked fabulous and sturdy as all get out. Well, my little stick tree is not that big and I have a large collection of empty pots since nothing plant wise wants to live at this apartment for some unknown reason. I washed out a pretty green one and put the base under the pot with the stem in the hole and it fit perfectly! Thanks Heather! Heather needs a blog to get all of her great ideas in, but with 2 kids and hockey and all the volunteering she does I don't think she has time. 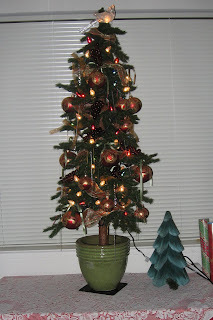 I have sprinkled a few pictures of my collections that I have chosen to display this year in this post. Some things are really old and some I made, all are special to me some way. I painted the nutcracker here many years ago when I was really into tole painting, I took classes for about 2 years and still have a large stash of paint and supplies from that almost as large as my fabric stash. They still come in handy from time to time. I also painted this Santa. He is about 4 feet tall. He was a lot of fun to paint. I used a tool that makes a wood grain pattern for his outfit then embellished him with some roses and little sprigs of green, I'm not sure why his eyes are closed, but he does look happy. I haven't had much time for sewing but, am hoping to squeeze some time in to work on making some Christmas cards. I had a blast at Michael's the other day when I found a dollar bin and lots of supplies to get creative with. If it all comes together as I would like I will do a post about it after I get them in the mail. I have scanned some scrap booking stickers to help cut down costs and with a little cut and pasting I am going to be able to make each card look different. I found some photo cards in the dollar bin that have Laura Ashley prints on them...that got me really excited and motivated. So... I must get to work on these so the recipients will receive them before Christmas. Today we will be celebrating my youngest son's 23rd birthday. My how time flies! Birthdays have a way of making me reflect on the past. I was remembering the day he was born...he hadn't turned so we knew he would be a cesarean and the delivery date was set a few weeks before. I guess he agreed with the date because by the time I got to the hospital I was having contractions and within 2 hours he was born. He was not an easy baby because he was sick a lot, but as a toddler he was my sunshine! I loved raising my boys and we have some really great memories to cherish. Happy Birthday, Rob! Enjoy your holidays and all the memories that come with them! 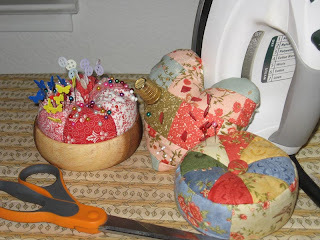 As I was taking pictures for this post I was looking around at all my sewing stuff and realized that I have actually made all 3 of the pincushions I currently have. The red one I set into a small wooden bowl I got in Hawaii. The heart I was making for a friend. fell in love with it and decided to keep it. I still have to make another one for her. The last one is the one I just made the other day. I have an even bigger collection of pin cushion patterns. I have been collecting a lot of sewing stuff lately. Maybe someday I will have time to use it all! 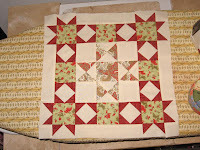 I have been really busy with work, but still making time to work on a few sewing projects. I would love to be able to make all my Christmas projects, but reality has set in and I know I won't be able to do it. The goal though is to maybe make my Christmas cards and I have a few ideas now I just have to find time to take a trip to Aaron Brothers and get a few supplies. Hmmm...how to fit that in, I'll have to work on that one. I have however managed to find a little time to make a few things. 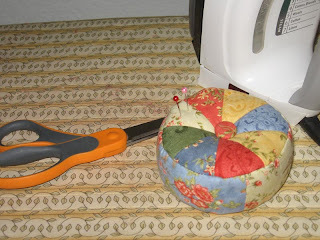 I made this little pincushion in just about an hour with a pattern I bought from Fig Tree & Co. I had to check out the site after seeing Joanna on The Quilt Show. It was a great episode. I just recently purchased a membership so that I could watch some of these shows and have been really enjoying it. The site was a little overwhelming at first because they offer so much, but now that I have it figured out I just can't stay away. I spent two whole evenings watching all the clips in Alex's Daily Blog. I haven't checked out Ricky's yet. I learned so many things from Alex, I had always thought of her as the person who interviewed quilters and didn't realize how much she actually knows about quilting. I also had to try out the tutorial I found at Happy Zombie which Monica so generously shared for penny pockets. It is a beautifully written tutorial and the project is so fun and easy. Follow my link and try it out if you haven't already. 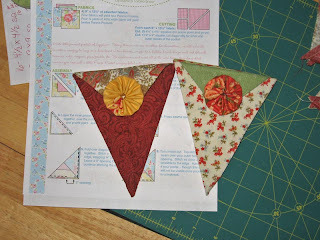 I am making mine from some fabrics I had in burgundy and green because it will match my Christmas ornaments. I am thinking of making a string of 7 to fill with goodies or candy canes, for a 1 week till Christmas countdown ...more thinking to do on that.